Respiratory Care majors learn to evaluate and treat people who have heart, circulation, and lung disorders and injuries. 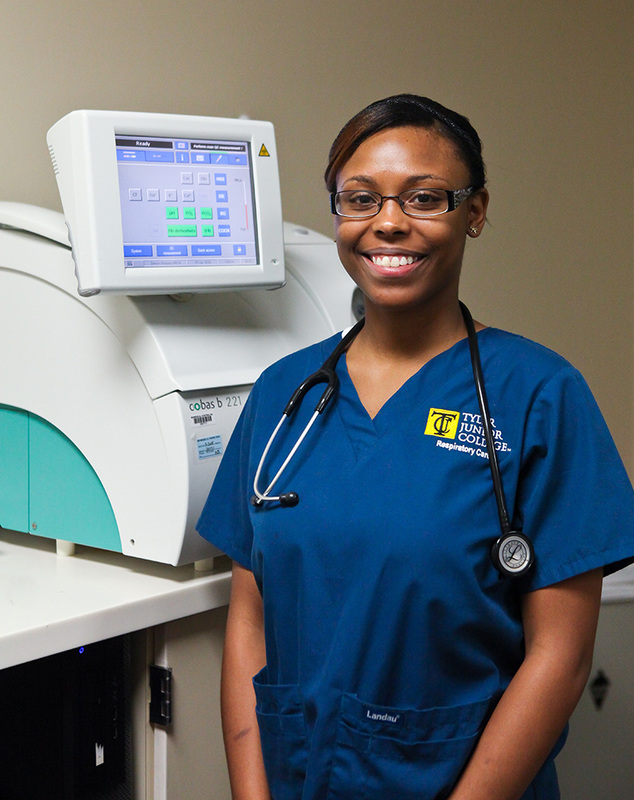 Our two-year program prepares you to become a Registered Respiratory Therapist and start working immediately. As a Registered Respiratory Therapist, you are a critical member of the healthcare team licensed by the Texas Medical Board to perform advanced life-saving procedures. You can expect outstanding compensation and benefits while advancing professionally. Our Respiratory Care program is a two-year curriculum that includes one semester of prerequisite courses and four semesters of lecture, laboratory, and clinical classes that prepare the student for a career as a respiratory therapist. The graduate of the program will receive an associate of applied science degree and will be eligible to apply for the Therapist-Multiple Choice (TMC) examination administered by the national board for respiratory care (NBRC). The graduate who achieves the low cut score will attain the CRT credential. The graduate who passes the TMC at the high cut score will then be eligible to sit for the NBRC Clinical Simulation Exam. If successful, the credential of Registered Respiratory Therapist (RRT) will be attained. The graduate is eligible for additional specialty examinations and credentials which include the Neonatal /Pediatric Specialty Examination (NPS), the Certified Pulmonary Function Technologist (CPFT) Examination, the Registered Pulmonary Function Technologist (RPFT) Examination, Adult Critical Care Specialty (ACCS) and the Sleep Disorders Specialty (SDS) Examination. Respiratory therapists play an important role in helping patients with breathing difficulties and cardiopulmonary disorders get the best care possible. Polysomnographic (PSG) Technology is an allied health specialty for the diagnosis and treatment of disorders of sleep and daytime alertness. The range of sleep disorders is varied but includes narcolepsy, sleep apnea, insomnia, and many others. TJC is an open admissions college; however, enrollment in this program is limited. All prerequisite courses should be completed before selection for enrollment into the Respiratory Care program can be made. Please fill out the selective admissions application to apply for this program.